* Color Flex will not fill cracks. * Comes with alcohol towels, but for large surfaces, it’s best to clean with our Presto Prep Cleaner for best adhesion. A 12 oz aerosol can holds 3.2 oz of actual color the rest is solvent and propellant. Makes any item look like new again! Ready-mixed, simply apply. 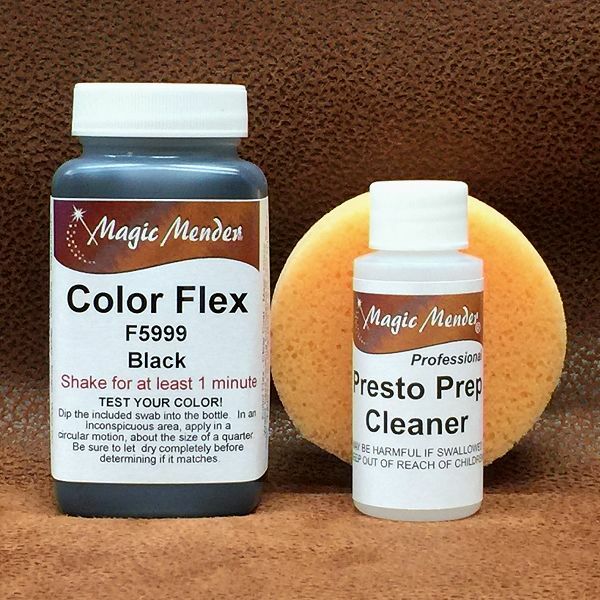 Color Flex is a specially formulated, water based finish that dries quickly, looks and feels like the original surface; just like the new finish coatings that furniture, clothing and automotive manufacturers use on their leather. Dries into a flexible Satin finish in about 15 minutes. See our Clear Coat page for other available top coat finishes. Highly flexible and scratch resistant. Will not crack, peel, or flake. 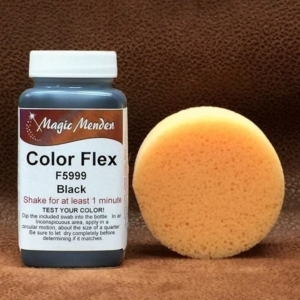 Color Flex will hide minor imperfections but it will not fill cracks. Only our repair compound can do that. Store in a cool, dark place with the lid tightly fastened. Make sure that the edge of the container is clean and free of any debris. Stored properly, Color Flex should last for several years without degrading. If it thickens, you can add some Clear Coat to it to bring it back to its normal consistency.